On an especially hectic night, both Roni and I couldn’t muster the energy to cook a meal at home. We were thinking of places that we could try and T’s Diner came to mind, as it was near the house and had recently opened. I wasn’t exactly sure what to expect from a place that bills itself as “American and Authentic Colorado-Mexican” cuisine. Having tried both sides of the border on the menu I was left with mixed feelings. On the other hand, our shakes were a disaster. I had a caramel shake and Roni had a chocolate shake. These shakes were so watery that they were scarcely able to be called shakes; it was more like flavored milk. Based on the burgers, we ended up going back to try the Mexican side of the menu; we were quite disappointed. Roni ordered a carne asada burrito. While the flavors were nice and the food tasted quite good, she could barely get through a bite without a rather large piece of gristle. I can understand a piece here or there, but almost a full quarter of the burrito was inedible connective tissues (FYI: “inedible connective tissues” is rarely a good thing). This speaks to laziness in preparing the meat and poor quality control in the kitchen. In my dish, I ordered a green chili sauce to go over my burrito, but red sauce was put on. Otherwise, there just wasn’t anything special about the burrito; it was immensely mediocre. Our service also left much to be desired. We sat at our table for several minutes after we were ready to order without anybody coming to the table to check up on us. There was only one other table seated, so I doubt we were lost in the crowd. Also, the server never came back to check up on how our meal was doing. If she had, we would have told her the issues we had with our food (Roni with the gristle, and me with the wrong sauce on the burrito) and moved on with the dinner as happy customers. However, the most unnerving thing was that when the waitress brought the receipt for me to sign she just waited there and STARED at us while we filled out the tip amount. Not just in a friendly “let me get that for you” kind of way, but in an awkward “I want to see the how much of a tip you leave AS YOU WRITE IT” sort of way. Furthermore, she wouldn’t give back the credit card until we had filled out the tip amount. It. Was. Weird. I’ve never felt so uncomfortable in a restaurant setting before. With that being said, I really cannot say enough good things about T’s burgers. If you want a the perfect diner-style burger, then this is the place for you. However, I suggest that you get you steer clear of the Mexican menu and that you get your order to go. tl;dr- Great burgers, mediocre Mexican. Hi Jaromgi, Thank you for your comments about our burgers! I am very happy you enjoyed them. I would like to offer a sincere apology to you and Roni regarding the akward experience of dining in. It is our goal to have all of our customers satisfied and happy. It is only by your feed back that we become aware of areas that need to be addressed and improved upon. I can assure you, your experience has been addressed. 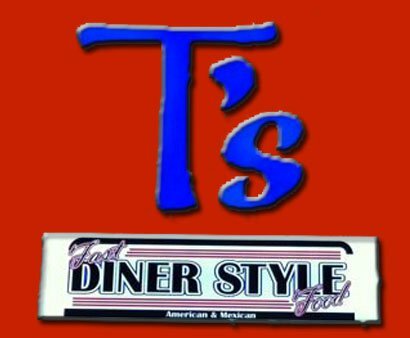 I hope that you and Roni will consider a visit #3 to T’s Diner on 900 E. Thank you for sharing your comments and I look forward to meeting you in the near future.